The new experimental evidence presented in The Ups and Downs of Child Language shows that it is possible to extend research on child language to children's semantic competence, adopting the same theoretical framework that has proven useful to the study of children's syntactic competence. 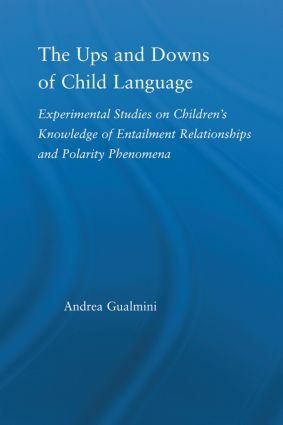 Andrea Gualmini investigates the role of entailment relations for child language in a series of interconnected experiments assessing children's negation and their interpretation of words like or, every, and some. Comparing his study to other models of language acquisition and characterizing the observed differences between children and adults, Gualmini asserts that even in the domain of semantic competence there is no reason to assume that child language differs from adult language in ways that would exceed the boundary conditions imposed by Universal Grammar.